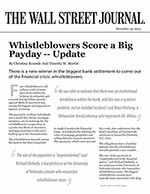 There is a new winner in the biggest bank settlement to come out of the financial crisis: whistleblowers. Four whistleblowers will collect a total of more than $170 million for helping investigators get a record $16.65 billion penalty against Bank of America Corp., among the biggest such payouts to tipsters in history. Deal with Justice Department could be announced as early as Thursday. 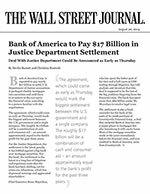 Bank of America Corp. is expected to pay nearly $17 billion to settle U.S. Department of Justice accusations it packaged shoddy mortgages into securities and sold them to investors in the run-up to the financial crisis, according to a person familiar with the negotiations. 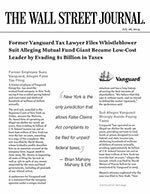 A former employee of Vanguard Group Inc. has sued the mutual-fund company in New York, saying it has avoided paying federal and state taxes and sheltered hundreds of millions of dollars annually.